?Can a living trust be used to avoid probate? ?Is a community property agreement right for me? ?How much does probate cost? Your will, formally called a “last will and testament,” is the legal instrument through which you document your instructions regarding what happens to your property when you are gone. Having a will does not necessarily mean your estate will avoid the probate system. What a will can do is speed up the process greatly and save your beneficiaries from certain legal and administrative costs, allowing them to receive a larger portion of their inheritances much more quickly. 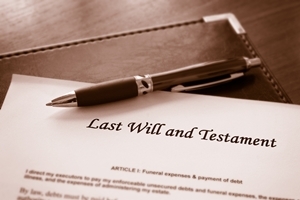 When someone dies without leaving a will, or his will is found to be invalid for some reason, the person is said to have died “intestate.” Intestate means that since there is no acceptable evidence of the decedent’s wishes, state law will be used to determine who inherits the assets of the estate. Intestacy does not mean that the government automatically takes possession of the estate and its assets. A personal representative—sometimes called an executor—is responsible for managing the estate’s affairs. This includes gathering all of the estate’s assets, paying any creditors, and distributing what’s left to the beneficiaries. Without a will that appoints your chosen personal representative, there are legal rules that determine priority over who is eligible for the position. When a person dies intestate, the duty of personal representative falls to a surviving spouse first. The spouse may appoint someone else if he is unable or unwilling to take the position. If there is no surviving spouse, the children are typically next to be chosen as representative, followed by other related family members. If nobody related to the decedent can be found, the court may appoint a neutral party. The surviving spouse will receive the remaining portion of any community property. Children or other descendants (including grandchildren) will receive half of the estate; the other half goes to the surviving spouse. Parents will receive one quarter of the estate if there is a surviving spouse but no children or descendants, with the remaining three quarters going to the surviving spouse. Siblings will receive one quarter of the estate if there are no surviving children, descendants, or parents. The remaining three quarters portion will go to the surviving spouse. Nieces and nephews will receive one quarter of the estate if there are no children, descendants, parents, or siblings. The remaining three quarters portion goes to the surviving spouse. Should there be no descendants, parents, siblings, nieces, or nephews, the full estate will go to the surviving spouse, along with the community property. Finally, should all of the options for inheritance be exhausted, the estate will “escheat”—be claimed by the State of Washington. In practice, this very rarely happens, as the rules of succession are designed to make state ownership the very last resort. While you can take steps to start your estate plan yourself by writing your own will, having a qualified estate planning professional can be beneficial. An estate plan attorney can help ensure that your estate will be administered by someone you trust, and your chosen beneficiaries will receive their full inheritances without the complicated legal questions of intestate succession. The Law Offices of Molly B. Kenny offer over two decades of experience helping people with estate planning and probate laws. We know that sometimes it’s hard to think about estate planning, but we can help you plan for the future of your family when you’re gone. Find out how we can help you today by arranging a private consultation at our Bellevue law offices. You can reach us at (425) 460-0550.